In this week’s Acton Commentary I examine the dynamics of marginalization and solidarity in the blockbuster phenomenon Black Panther. As so many commentators have suggested, there’s a lot to this film, and one of the important things it has to offer is a valuable perspective on the underlying unity amidst diversity in humanity. Another aspect of the film worth highlighting is that it presents Wakanda, and Africa more generally, as having something positive to offer the world; advanced technology and rare resources, yes, but indeed more generally a vision of fraternity that underscores a positive moral responsibility towards our neighbors. A number of analyses have underscored Jewish parallels or significance in Black Panther, including similarities between T’Challa and Esther. An additional biblical analogues is that, by the end of the film, Wakanda has embraced its destiny to be a kind of light among the nations, a city on a hill. As Abraham Kuyper contended, this is one of the lessons that ancient Israel neglected, viewing its blessings as privileges to enjoy rather than gifts and responsibilities to be stewarded. In Kuyper’s words, “The nations do not exist for the sake of Israel, but Israel exists for the sake of the nations.” Israel was always intended to be directed as a pedagogical and missional community, set in place to promote the flourishing of the nations. Wakanda similarly led an isolated existence until the events in this film, where the dynamics of marginalization and solidarity come to a solution in T’Challa’s opening up of Wakanda to the world. 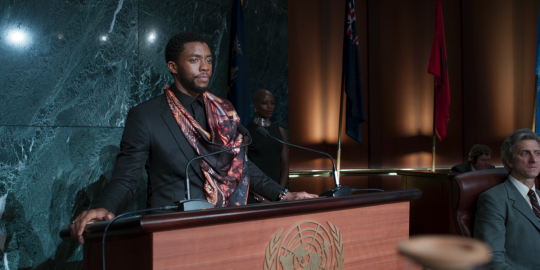 T’Challa’s challenge in the film is to find a future for Wakanda that does not tread the isolationist footsteps of the past, and likewise does not fall into the errors of imperialistic conquest and militarism. Nakia represents the consistent moral call that the nations do not exist for the sake of Wakanda, but that Wakanda exists with a responsibility toward the nations. Black Panther helps us to see that each one of us has something to offer in service and love to the rest of humanity. For too long Westerners have thought of others, particularly Africans, as either having little or nothing to offer, other than perhaps whatever natural resources exist there or whatever value might be extracted from enslaved bodies. The vision of international engagement and solidarity within the context of cultural diversity and complementarity offers us an articulation of global development that reflects the deepest lessons arising from the last two centuries of economic development. As the development economist Amartya Sen puts it, “A sense of racial or civilizational superiority has served, for a long period, as a barrier to open-minded assessment of developmental thinking in a world of imperial dominance.” This kind of perspective continues to be implicit in many aid organizations and global institutions. And it is a perspective that Black Panther provides us with strong reasons to transcend.